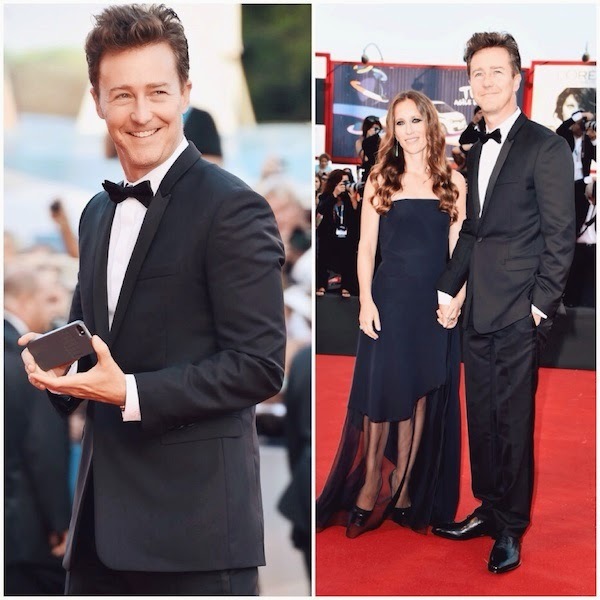 Edward Norton and his wife Shauna Robertson attended the Opening Ceremony and premiere of 'Birdman' during the 71st Venice Film Festival in Italy. Edward Norton wore a narrow lapel black ‘grain de poudre’ tuxedo, over a white cotton shirt and a black silk bow tie, all from Dior Homme. "Birdman" is not a superhero movie, but a drama about a washed-up actor who is desperate to escape the shadows / glories of his past. The black comedy tells the story of an actor, famous for portraying an iconic superhero, as he struggles to mount a Broadway play. In the days leading up to opening night, he battles his ego and attempts to recover his family, his career, and himself. Directed by Alejandro Iñárritu, "Birdman" stars Edward Norton, Michael Keaton, Zach Galifianakis, Andrea Riseborough, Amy Ryan, Emma Stone, and Naomi Watts. Looks like an interesting movie to me, and don't Edward Norton look fab at the film's premiere? Love the classic and nicely tailored tuxedo, the gorgeous smile helps too.